It’s a big week across the NFL—28 of the league’s 32 teams are in minicamps. The other four are wrapping up their offseason programs with one last set of OTAs. And by the time we get to next weekend, the NFL will be on its summer break. Therefore, there’s a lot packed into this week’s MMQB. We’re going to check in on the Browns, and how Hue Jackson has put last year in the rear-view. We’ll weigh in on the blow up between the Eagles and the White House. We’ll bounce around the league with nuggets on guys who have emerged this spring. And we’re going to share details on a visit Kobe Bryant took to Foxboro in May. The Kobe visit was an interesting one, because of Bryant’s experience as an athlete who played 20 professional seasons. The Patriots have a guy like that—Tom Brady is approaching his 19th year, and he’s done it a different way in 2018, staying away from all voluntary phases of New England’s offseason program. He was back last week at the team’s mandatory minicamp, as you might have heard. And when he and I spoke afterward, the question that was lingering was what he took from spending the last seven weeks away. The answer was tremendously… normal. And when I asked if this represented an unplugging of sorts, which I’d heard he wanted, he quickly combatted the idea, because it is not as if he disengaged altogether, nor did it look that way on Tuesday, Wednesday or Thursday. We’ll get back to Brady and the Kobe connection in a bit. 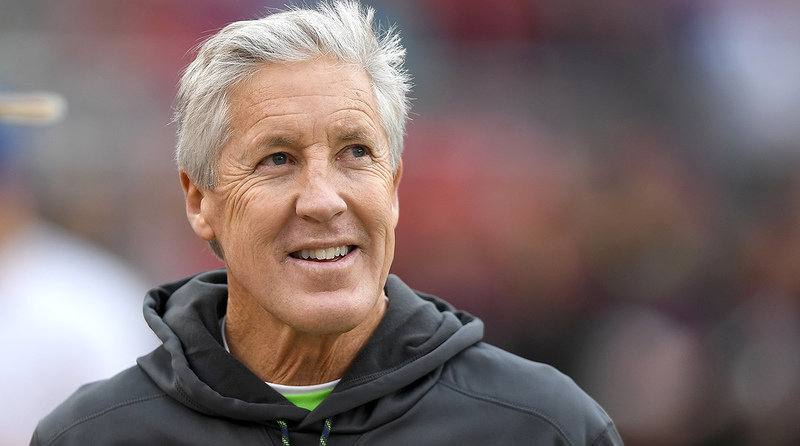 But we’re going to start with the Seahawks’ reset, and what it means for Carroll’s program. A couple weeks back, Browns coach Hue Jackson fulfilled a promise to the fans in Cleveland, jumping in Lake Erie as a form of penance for going 0-16. He called it an “outstanding day for all involved,” in part because owner Dee Haslam was there, and in larger part because $30,000 was raised for his foundation. It’s also the last he wants to hear about 2017. When he and I spoke on Thursday night, Jackson told me the players haven’t heard much from the coaches about it this spring. And they won’t either. The Browns’ minicamp this week will wrap up what’s been a much different offseason in Berea. After the Browns took an analytically driven, patient approach to building the roster in 2016 and ’17, new GM John Dorsey showed overwhelming urgency to get the team to 2018. It was a big news week in Foxboro, with Brady and Rob Gronkowski back, and word emerging on the final day of the Patriots’ minicamp that Julian Edelman failed a PED test and, pending appeal, will be shelved for the first four games of 2018, delaying his return from ACL surgery. Perception might not match reality, but it sure feels like the New England dynasty is more vulnerable than it’s been at any point this decade. And so Bill Belichick’s handling of this offseason has been under the microscope. Along those lines, there was one move he made a few weeks back that was fascinating to me (and maybe only me): The 66-year-old coach brought in Lakers icon Kobe Bryant just after Memorial Day. Among Bryant’s talking points was the importance of training, and of studying other players, to his ability to play two decades in the NBA. The Patriots who were listening have another pretty good example of longevity in their own locker room, and they made the connection quickly. New Patriot Jeremy Hill told me that Bryant’s study of Allen Iverson stuck out in the speech, because it was a result of Iverson lighting Bryant up early in his career. Bryant also relayed stories of incorporating elements of what Michael Jordan, Larry Bird, Bill Walton, Kareem Abdul-Jabbar and Magic Johnson did as players and pros into his own routine. I don’t know exactly why Belichick brought Bryant in, but I sense that the message Kobe delivered absolutely resonated. And given all that’s happened in Foxboro over the last six or seven months, and how much of it relates to Brady’s own training methods and their influence in the New England program, it’s pretty interesting how it lines up with the juicy storylines we’ve been following since January. It’s no accident that the NFL announced the banning of kneeling today, effectively muting any pick up of @RealSportsHBO story on the concussion settlement. The NFL are masters at manipulating the press for self serving purposes. I missed this a couple weeks ago, but it’s a pretty interesting point to make, especially in light of where the concussion settlement has gone. The Real Sports piece is well worth your time. So far, so good for Hamilton Tiger-Cats QB Johnny Manziel. It’s not much yet, but in the clips I’ve seen, he looks like the smooth, natural athlete he was as a collegian. It’s gonna be hard for ol’ J.R. to live this one down. 1. If you’d told me on the morning of April 26 that Derrius Guice would wind up being the seventh back taken in this year’s draft, I’d have called you crazy—and that would have been even with the knowledge that he was facing off-field questions. But that happened, and now it looks like the Redskins are the beneficiaries of murky rumors emerging on Guice during draft week, which precipitated his fall 27 picks into the second round. Washington coaches love what they’ve seen from Guice so far. Yes, it’s non-contact spring work, but his vision, patience, explosiveness and hands have been apparent. Even better, they see a passion for football in him, which is one thing teams look for in players who’ve had maturity issues (Guice has) as an indicator that they’ll grow past them. Obviously, Guice still has a long way to go, but if he keeps putting it together like he did over the last month, he should be a factor in the fall. 2. Speaking of impressive springs, you can also mark down new Rams receiver Brandin Cooks. You might have seen the video of Sean McVay lusting over Cooks’ ability—“How about how fast Cooks looked on that strike? … You see how fast Cooks is? Oh God!” The truth is, the team had a pretty good idea of what the fifth-year pro would bring to the table. What they’ve learned for themselves since is of his great attention to detail, practice habits and work ethic. And it ties into what Patriots OC Josh McDaniels told McVay as the trade was going down: Cooks didn’t miss a single practice rep last year in New England. A first-round pick was, of course, a hefty price to pay. But early indications suggest L.A. won’t regret it. 3. A slow-developing safety market has been a part of the Eric Reid storyline. And we’re still where we’ve been on that. On Thursday, Reid, Kenny Vaccaro and Tre Boston—starting-level players—will hit the three-month mark as free agents. It’s crazy, and an indication of a widening gap in how teams value corners and pass rushers vs. players elsewhere on defense. A lot of teams believe, right or wrong, that they can get by with less at safety. That said, it’s worth mentioning that the two Super Bowl teams invested pretty heavily in versatile pieces at the position—Malcolm Jenkins in Philly, Devin McCourty in New England. 4. The Bills are a good example of a team that made it work at safety with less. Last year Buffalo got better ball production out of its starters at the position (10 interceptions) than any other team in football. Those starters, Micah Hyde and Jordan Poyer, are back, and veteran Rafael Bush was added to the group, and I’m told the Bills are ecstatic with their safety situation given how those three worked together in the spring. The cost? Hyde is making $6.1 million per, Poyer is at $3.25 million per, and Buffalo pried Bush from the Saints for $3.5 million over two years. So the Bills are paying a total of $11.1 million per year for two starters and a top backup at the spot, which is less than the franchise-tagged Lamarcus Joyner will make for the Rams this year, and almost $2 million shy of Chiefs S Eric Berry’s APY. 5. I know what Julian Edelman posted on Instagram in the wake of the suspension news (“I don’t know what happened”) came off as a little weird, but there is an explanation for it. I was told Edelman’s result was triggered by a substance that wasn’t immediately recognizable, and there are scientists analyzing it. And as to the timing, the test did happen during the offseason (a couple months ago), which means it’s not for any kind of stimulant. You might remember the rash of players saying they got popped for Adderall—the rules have changed now so that offseason use of stimulants falls under the substances of abuse policy, rather than the PED policy. 6. I don’t know what’s left to say about what happened with the White House last week, other than that these national anthem decisions are now being made based on business. For Donald Trump, this is about the business of getting re-elected, and having this red-meat issue to engage his base. For the NFL, its (sloppy) effort to find an exit strategy is about the business of its sport, which is best when the league appeals to the largest audience possible. Would the NFL like to see all of this come to an end? Absolutely, which is why the main talking point coming out of Atlanta centered on the owners wanting to put the focus back on football. Unfortunately for those guys, they’ve got a pretty powerful foe who wants to prevent that from happening. 7. If Julio Jones wants an adjustment to his contract, it would be tough to blame him. He’s now making less than Mike Evans, Sammy Watkins, Jarvis Landry and Davante Adams. Jones is three years into the deal he signed in 2015, meaning he’s out of the guaranteed money, with three years left. He has an extensive injury history, and he turns 30 next February. There will come a time, of course, when Jones’s skills will erode, and Atlanta will come looking to give him a financial haircut (like Arizona once did with Larry Fitzgerald) or his walking papers (like Dallas did with Dez Bryant). So he might as well see what he can get before all that happens. 8. Ditto for Earl Thomas. He’s had a litany of injuries, and he turns 30 in less than a year. There will come a time, and soon, when his value starts to nosedive. I’ll never blame a football player in that situation for trying to leverage a team. 9. I have trouble getting worked up over Terrell Owens’ plan to skip the Hall of Fame induction ceremony. I wouldn’t advise a player to do it, but I look at this the same way I look at top prospects deciding whether or not to attend the draft: It’s amazingly difficult to get there, and each guy should have the right to celebrate how he sees fit. And the idea that this act by Owens makes him any less deserving of induction is patently absurd. 10. I thought the surprise in Detroit over new coach Matt Patricia making his players run laps was way overblown. For one, people there I know have said that the guys who worked under Jim Caldwell were a pretty disciplined group to begin with—it was a hallmark of how Caldwell wanted his teams. It’s not like Patricia and his players were starting from zero. In fact, Caldwell would assess fines, rather than penalty laps, and you can guess which method the players wind up preferring. And then there’s where Patricia came from, which makes this predictable. Just this week, in fact, Bill Belichick assessed penalty laps for mental errors on two occasions, in plain sight of the media, and then wrapped the minicamp by making his players run hills. That isn’t treating guys like they’re in high school. That’s conditioning them for an NFL season. 1. You can believe that Kevin Durant had every right to make the decision he did two summers ago, while also believing that jumping into a moving Ferrari like he did has given the titles he’s won a totally different feel than they would’ve had if he’d won with a team that wasn’t already a burgeoning dynasty. It’s O.K., I don’t think you’ll hurt too many people’s feelings. 2. And so here we go with the Summer of LeBron III. It would be cool to see him stay in Cleveland. But at this point I think he has to think of going to a place where there are young superstars that he can eventually pass the baton to, once age starts to strike (and who knows when that’ll happen?) and he has to reinvent himself as more of a complementary piece. 3. Alexander Ovechkin has a shot to rival the post-Cup summers enjoyed by Patrick Kane and Brad Marchand. And by the time it’s over, we’re going to wish that Lord Stanley could talk, because he’d have one heck of a story to tell. 4. We just had our anniversary weekend in Nashville, and I had no idea that something called CMA Fest was going to be there while we were. And that whole thing was one incredible bleep-show. I saw … a lot of hilarious things. And it felt like every bachelorette party on the planet was there the last three days, too. 5. Justify crushed it, no question. But what an impressive comeback bid at the Belmont by Gronkowski’s horse … Gronkowski. Gronk the Horse looked like he didn’t belong coming out of the gate, fell way behind, and somehow came as close to beating Justify as anyone at the Belmont, after missing the Derby and the Preakness with an injury. And now Gronk the Horse gets to go live the life his owner would have for him. Aaron Donald isn’t expected at Rams minicamp. Khalil Mack’s status for Raiders minicamp is up in the air. Le’Veon Bell still hasn’t signed his franchise tender, so he won’t be at the Steelers’ mandatory work. Earl Thomas plans to miss this week. We’ll see about Julio Jones. Everyone will be watching Odell Beckham Jr.’s involvement at Giants minicamp closely, too. Is skipping worth it? Maybe this is just what I remember of the last few years, but it seems teams aren’t often moved much by players missing work in the spring. The summer, of course, is a different story—that can make management squirm a little. We’ll all make a big deal—probably too big a deal—of these things this week. If any of these wildcat contract strikes are still going on six weeks from now, well, then that actually would be a big deal.